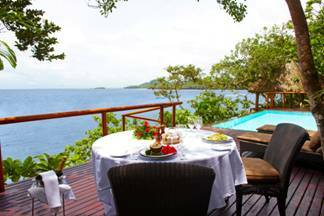 Namale Resort & Spa in Fiji announces a special Holiday Romance package, offering guests the chance to stay seven nights at the 5-star resort for the price of five. Voted the Best Hotel for Romance in the South Pacific by Trip Advisor® and One of the Top 50 Most Romantic Places on Earth by Luxury Magazine, the all-inclusive resort and spa provides the idyllic backdrop for romance, unparalleled luxury and privacy. To take advantage of this package, guests must plan to stay at Namale now through February 28, 2012. 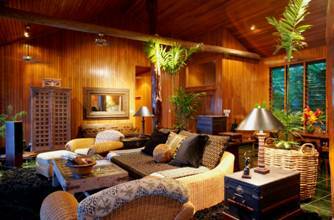 Couples can also expect extra perks upon their arrival at the resort. · Complimentary activities include freshwater pools, snorkeling, kayaking, horseback riding, golfing, volleyball, bowling, virtual golf, waterfall hikes, movie theatre and more! Namale Resort & Spa served as The Bachelorette Ashley Hubert’s fantasy getaway in the ABC’s Television Network’s seventh season. Namale offered Ashley and her potential suitors the ultimate in romance –private villas, walks around the grounds to nearby rushing waterfalls, private dinners and luxurious spa treatments – an experience any couple can take advantage of with Namale’s Valentine’s Day package. Offering 19 bures and villas of award-winning accommodations, along with 120 on-call staff members, Namale caters to anything their guests could ever need or want. Set on a volcanic cliff near an opaque rain forest, the Namale Fiji Spa and Sanctuary provides world-class treatments, ancient aromas, soothing rhythms and skilled therapists to guide guests on unforgettable journeys of rediscovery. About Namale: Namale is the getaway for romance, relaxation, pampering and a spiritual renewal. Located on the edge of the Koro Sea in Savusavu, Fiji, the award-winning, five-star resort and spa has received numerous accolades, including One of the 50 Most Romantic Places on Earth by Luxury Magazine and 2010 World Travel Award as Fiji’s leading Spa Resort. The 525 acre resort and spa boasts 19 unique villas and bures, a world-class spa that merges ancient wisdom with the knowledge of modern medical sciences and research to create a generous variety of activities.